System Junk usually takes the biggest crop of unneeded files, which may occupy gigabytes of the storage. These files are generated automatically and can be removed safely. For example, most of the space is reclaimed after removing old cache files and logs, unused languages, excessive versions of documents, and Xcode junk. 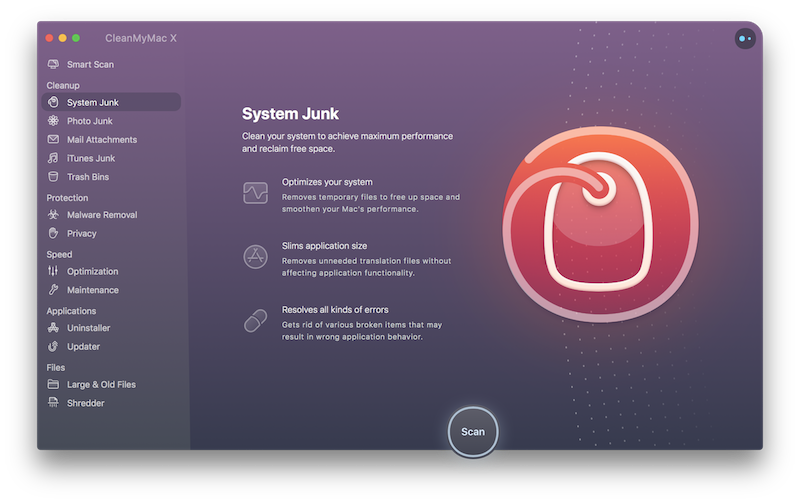 Scan: Navigate to the System Junk module and click Scan. Or, switch to the detailed results, check a full list of found items, and make your choice. Broken Login Items: When you remove an application or a service, a broken link to it may remain among your Login Items. CleanMyMac easily removes those links. Broken Preferences: Sometimes application preference files get corrupted, which leads to improper behavior or inability to launch applications. Generally, removing broken preference files eliminates these negative effects. Document Versions: Many apps save versions of a document so that you could restore its earlier versions. It happens automatically, as you work on a doc, or manually, when you command to save changes. The feature is useful, but you may be surprised to discover that copies of your documents occupy gigabytes of space. By default, CleanMyMac never offers to remove the earliest and latest version of your doc. It automatically selects only those versions that were made with less than 4-hour interval, keeping the latest one in the range. Language Files: Almost every application comes with multiple localizations you do not use. You can safely remove them to save a significant amount of disk space. macOS Localizations: Your Mac's operating system includes dozens of languages files, most of which you'll never use. CleanMyMac deletes unneeded language files to save your space. Old Updates: Some applications don't clean old versions of their updates. Therefore, these outdated files may take up a lot of space on your Mac. Removing old application updates is safe. System Cache Files: System applications generate and keep a lot of cache files, which after a while result in longer startup time, performance degradation, and possible improper system functioning. CleanMyMac cleans cache and improves performance. System Log Files: The activity of your system applications and services is being logged into numerous files. Generally, they are useful for debugging purposes only and therefore are hardly worth employing your disk space. Unused Disk Images: After you installed an application, you probably leave its DMG file just where it was. So your Mac may store numerous DMGs which can be painlessly removed. User Cache Files: Originally intended to improve startup time, the cache files of your applications ultimately accumulate, which results in improper system functioning or overall performance drop. User Log Files: The activity of your applications is being logged into numerous files, which start using a lot of space after a while. However, these files are rarely used and useless if old. Xcode Junk: If you are a developer, you might want to clean up your system from a significant amount of intermediate build information and project index generated by Xcode. This CleanMyMac ability will come in useful when you need to free some space. Note that CleanMyMac doesn't remove Module Cache and Archives automatically. Xcode Junk: iOS device support files, archives, module caches, Xcode documentation cache, and available iOS simulators. You can exclude some of the System Junk submodules from the scanning process. Go to CleanMyMac X → Preferences → the Scanning tab and deselect the checkboxes of submodules you don’t want to be scanned. Note that your choice also affects the Smart Scan module. If you'd like to reliably protect some items from removal, you can add them to CleanMyMac's ignore list. This will hide the selected items from the current scan results and ignore them in future. Click Review Details on the scan summary screen of the module. Then, review items on the detailed results screen and control-click the one you'd like to hide. Choose Add to Ignore List from the shortcut menu. Go to CleanMyMac X → Preferences → the Ignore List tab. Switch to the System Junk module on the Ignore List tab. Choose an appropriate item and click Exclude (-). Done! This item is not ignored anymore and will be displayed in future scan results.